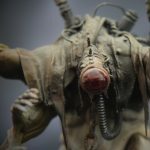 Modern Synthesist: How to Sculpt Miniatures - Video Tutorials! I've been working on this, on and off, for a looong while now, but I'm happy to finally announce the launch of How to Sculpt Miniatures video tutorials! This here is the introduction video, and there's a link at the end to the first episode, all about Tools! The next episode will be up in two weeks. I hope you enjoy them, and please let me know what you think! Also, I'm eager to hear what people want to learn How To Sculpt.